PARIS (AFP) - Layvin Kurzawa scored an unlikely hat-trick as Paris Saint-Germain powered into the last 16 of the Champions League on Tuesday (Oct 31) with a 5-0 rout of Anderlecht, while Bayern Munich joined them in the knockout stage. Marco Verratti curled in a terrific opening goal - his first in Europe since September 2014 - on the half-hour at the Parc des Princes, with Brazilian superstar Neymar firing in a second before the break. The world's most expensive player was involved in PSG's third goal as well, as his free-kick was tipped onto the post with France international Kurzawa forcing in the rebound. The left-back then headed in another from a Dani Alves cross and completed an improbable treble with an angled drive as PSG increased their goals haul to 17 - with none conceded - in four Group B matches. 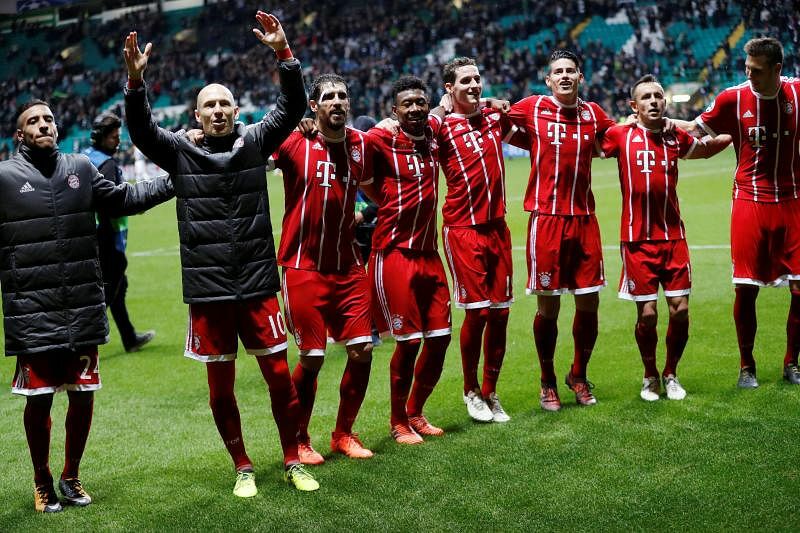 The French giants top their section with a maximum 12 points, with Bundesliga leaders Bayern progressing alongside them following a 2-1 victory away to Celtic. Kingsley Coman pounced on hesitant Celtic defending to latch onto a long clearance upfield from goalkeeper Sven Ulreich and round Craig Gordon to slot into an empty net on 22 minutes. Callum McGregor slotted in a second-half equaliser, but Javi Martinez's brave towering header - which left the Spaniard bloodied - clinched qualification for the Germans in Glasgow. Jose Mourinho's Manchester United were made to wait to seal their passage into the next round despite a 2-0 win over Benfica. Benfica's Mile Svilar, who became the youngest goalkeeper in Champions League history a fortnight ago, suffered more misfortune at Old Trafford as his own goal handed United a 45th-minute lead. The 18-year-old, at fault for the 1-0 defeat in Lisbon, atoned for that error by saving an Anthony Martial penalty, but Svilar was helpless when Nemanja Matic's low drive cannoned off the post before hitting him on the arm and squirming over the line. Daley Blind wrapped up victory from the penalty spot on 78 minutes after a foul on Marcus Rashford. CSKA Moscow reignited their campaign with a 2-1 victory at Basel in the other Group B fixture. Luca Zuffi's brilliant lob put Basel in front, but CSKA levelled through Alan Dzagoev in the second half before Pontus Wernbloom steered in the winner to leave the Russians level on six points with their Swiss hosts. Lionel Messi and Barcelona were frustrated in a goalless stalemate with Olympiakos in Greece, while Juventus salvaged a 1-1 draw at Sporting Lisbon after Gonzalo Higuain levelled late on following Bruno Cesar's opener. Barcelona remain top of Group D with 10 points, three ahead of last year's runners-up Juve, with Sporting on four. Chelsea squandered a chance to secure a berth in the knockout stages as Stephan El Shaaraway inspired Roma to a 3-0 success over the Premier League champions in Italy. El Shaarawy drilled Roma ahead after just 40 seconds at the Stadio Olimpico as he ran onto an Edin Dzeko knockdown to slam home from the edge of the area. The Italy striker netted a second on 36 minutes with Diego Perotti rifling in a third from 25 yards as Roma replaced Chelsea at the top of Group C with two matches remaining. Roma are on eight points, one above Chelsea, but Atletico Madrid - finalists twice in the past four seasons - are heading for elimination following a 1-1 draw at home to Qarabag. Journeyman Spaniard Michel headed the Azerbaijani champions in front from a corner, and while Ghana midfielder Thomas Partey hammered in an equaliser, Diego Simeone's side must now beat both Chelsea and Roma and hope other results work in their favour.